As part of Print+Promo’s ongoing feature, Executive Perspectives, we get to know leading professionals in the print and promotional industry. This month, we interviewed Darwin R. Bethke, general manager of Action Printing, Fond du Lac, Wis. Here, he talks about his goal-setting process, the need for fresh talent and new company initiatives. Darwin R. Bethke: When I was a freshman in high school, I took a class called “Graphic Arts.” At the time, I honestly had no idea what I was signing up for. Looking back now, [I would say] it was one of the best decisions I have ever made. I discovered a whole new world called “printing” that is filled with constant excitement and changes. That same year, I began working in our local newspaper office—printing commercial jobs, typesetting, doing paste-up and working in the darkroom. 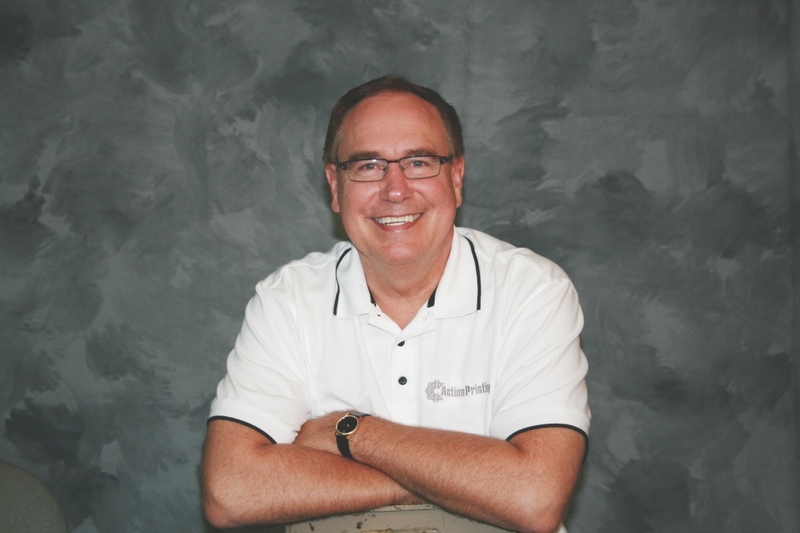 Forty-plus years later, I am general manager of Action Printing overseeing sales, administration and production. DRB: I have been told by past and present employees that I am never content with the way things are being done. And they are correct. I believe in setting goals that are very fluid—both long- and short-term. Once a goal is obtained, reward yourself or your staff, and then begin a new one. There is always a better and faster way of getting things done. DRB: It is great to finally see a positive trend in the economy. Action Printing will see a revenue increase of almost a million dollars this year. This credit can only be given to our team of associates [which] is the best in the business! Sales works closely with our clients to help them grow their business. Production carries a positive can-do attitude to make sure customers’ products get to them on-time and within budget. DRB: There is no question [that] the amount of print today has declined. Printers thriving in today’s marketplace will need to provide more and more customized services, down to the smallest detail. We want to partner with our clients and be flexible in our approach. Every business has its challenges; we try to help find unique solutions and clear any obstacles to growth. Because Action Printing works with an extremely diverse client base—from kindergarten picture books to outboard motor catalogs—our workflow has been fine-tuned for maximum output and efficiency. We are able to produce quantities as low as one to several thousand by using both conventional and digital equipment. DRB: Currently, we are seeing several long-term, dedicated and knowledgeable employees retiring. With our unemployment rate so low, it is almost impossible to find anyone to replace these individuals. When [companies] do find good candidates, they seem to only work for a short time. This type of turnover can increase labor expenses while opening the door to potential mistakes at the expense of our customers. Through hours of cross-training, Action Printing is able to adjust to our customers’ requirements. DRB: We are always looking for new ways to serve our customers. Listening to our clients helps give us direction. We truly value their input, and it’s incredibly rewarding to have a role in their success. Currently, we are looking at NFC (near field communication) to see how this can help our customers grow their business. In addition, we have expanded our fulfillment operation, offering a one-stop solution to our clients. DRB: There was a time when I was homeless and lived in a tent. While on mission trips, I have seen Haitians living without homes. These individuals can only better themselves by [receiving] an opportunity to learn and grow. When I retire, I plan on spending time in Haiti to help make their lives better.